Place vinegar, water, sugar and spices in a small pot. Bring to a boil, then remove from heat and pour mixture over carrots. Set aside until cooled. (This allows time for the carrots to pickle). Whisk gochujang, vinegar, lemon juice, sugar and garlic together. Set aside until serving. Place non stick pan over medium- high heat. Toss turkey with soy sauce and pan fry in 1/2 tbs of vegetable oil. Cook tossing continually until soy sauce has thickened and turkey has started to brown. Remove turkey from pan, and use the pan to panfry the mushrooms in 1/2 tbs vegetable oil, the spinach in 1/2 tbs vegetable oil and the zucchini in 1/2 a tbs of vegetable oil. Season all the vegetables after they have been pan fried and set aside until assembly. In a medium-high heat, fry egg in the remaining vegetable oil to desired degree. I like my yolks to be between soft and medium because I LOVE the runny yolk when it mixes with the crispy rice. 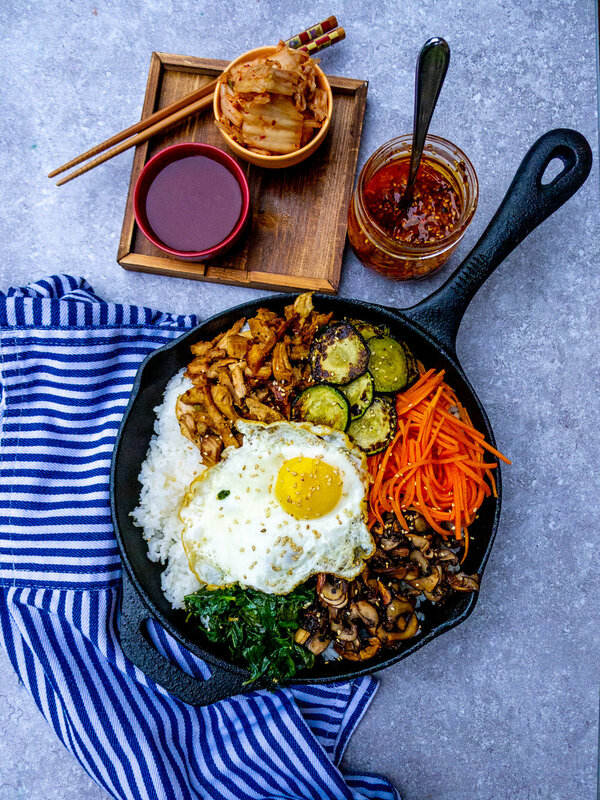 Brush cast iron skillet with sesame oil. Place pan over medium high heat , press cooked rice into the pan. Do not stir as this is how you achieve the crispy rice! Let the rice reheat and crisp up (approximately 5 minutes). Top rice with warmed vegetables, turkey, pickled carrots and fried egg. Top with sesame seeds and serve with gochujang!